Machinarium costs $4 on Google Play, but hold before you leave because it’s well worth a lot more. If you haven’t heard of the title, you probably don’t play on the PC much. Machinarium is an indie game for PC’s and Macs released back in September 2009. Developed by Amanita Design, a Czech studio, the game with a multitude of awards as the best indie game of the year, and acknowledged to be the best in the artwork and soundtrack. 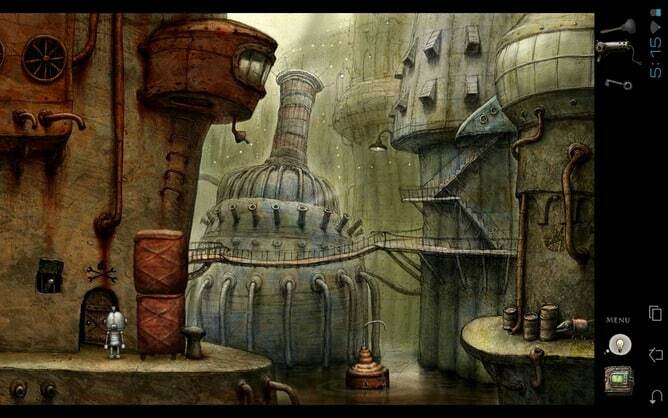 Basically, anyone can play and get addicted to the Machinarium since it is a challenging, yet friendly and forgiving puzzle-solving experience that will fascinate you with a cute and deeply compelling story, astoundingly beautiful hand-drawn visual effects, and an original electronic soundtrack equal to, or even better than Half Life 2 OST. Once you try the demo out, you will get deeply engrossed in the game, and will have no choice other than pay the four bucks and enjoy the incredibly cute and challenging adventure. But first, let’s see what the game consists of. When you go to Google Play store and find Machinarium, it may appear as compatible with your smartphone, which, in fact, may not be entirely true. The game makes you solve intricate puzzles, sometimes collecting ridiculously small objects, which may be way too challenging on the screen of a smartphone even if you have a Galaxy Note. You will find yourself stranded on the first few levels after a while. So, we strongly recommend you install this game on tablets, the bigger display, the better because regular 5.3-inch smartphones will cause you frustration and aggravation instead of enjoyment. Since Machinarium was designed as a PC game to be played with a mouse, active zones for tapping and collecting objects are incredibly small. At times, it is annoying, yes, and it may be a good idea to use Bluetooth Android compatible mouse or even the trackpad if you have a keyboard dock. On bigger screens, though, it is completely possible to beat the game using the touchscreen only, but sometimes you would want a mouse. The game is built solidly and runs smoothly, never crashing. However, if you switch apps, it will reset every time, so save your progress before you switch. 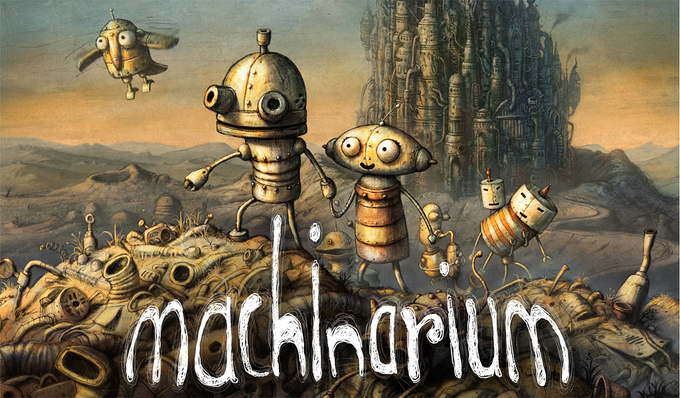 Overall, these are the only issues with Machinarium, so let’s get into the interesting part. You get to solve riddles, laugh your head off, sometimes, just make a pause and look around at the beautiful scenery and enjoy the soundtrack meticulously created by the designers. Machinarium is definitely more than just a puzzle game – it is an engrossing experience, an adventure movie and a personal quest. 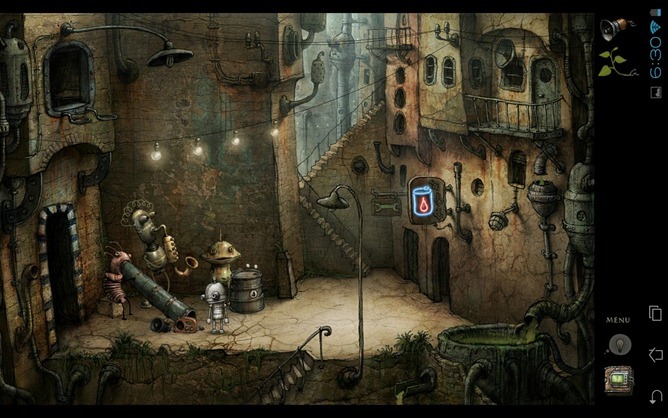 You don’t need to be a big fan of puzzle and hidden object games to enjoy Machinarium; in fact, you don’t even have to be a great devotee of Android games at all. The set of the game appears random and out of context when you first look at it, and that’s what makes it so challenging because it keeps you trying to guess what is going on there. The storyline is quite simple, but shady at the beginning to keep you hooked. During the first levels, you keep wondering where this game is headed, and there is no way of guessing in it at that stage. You start off as a half assembled robot trying to make his way to a highly gated metropolis, and you’re not sure why he needs to get there. We’re not going to reveal the entire storyline because the story itself makes 50% of the fun playing the game. What you need to know by now is the storyline will make you enjoy, wonder and giggle all along. As far as Machinarium is concerned, we’re not talking about visual effects – we are talking about real artwork that is incredibly beautiful. Designers obviously put their heart and soul into this amazing world of fantasy and dream while the music is like a cherry at the top of the cake, enchanting and undoubtedly talented. Machinarium, nevertheless, is more than just an interesting story, beautiful artwork and catchy electronic music assembled into puzzle game. 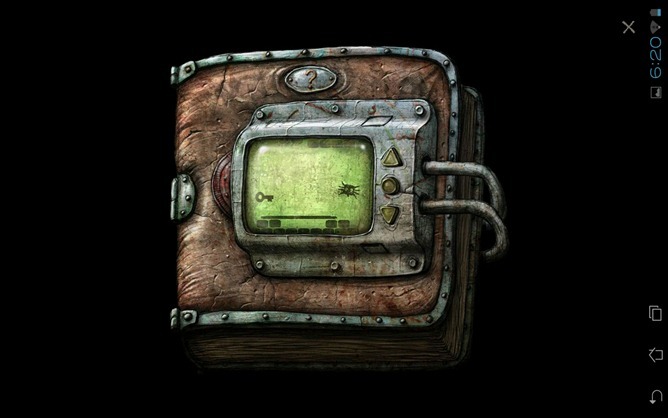 In addition, the game urges you to solve puzzles, and if you are impatient, you can actually manage to solve the game in one single day because there is a little help book at the right bottom corner of the screen. The help book in itself is an adventure because it consists of mini games, and every time you need a tip, you will have to play and watch a mini game of about 30 seconds, so actually, it’s another adventure. You’re being rewarded for your patience with a map or instructions on how to solve the puzzles in a particular level of the game. Highly detailed maps show you exactly how to solve puzzles and riddles, and in what order, so you’ve got to be very lazy not to be able to beat the game. You can call it cheating while it is actually a Christmas present from the developers because if you choose to play the game without the hint book, it would probably take you weeks – some levels are unbelievably challenging. However, if you have enjoyed the Myst of Yore, you would probably crack this peanut in no time. Every time you resort to the help book to get a map to solve the puzzles in the level, you will have to play the mini game. That’s why you will have to remember the detailed diagrams in order to avoid playing mini games over and over again. In addition, it also discourages you from resorting to the tips too often. The lazy folks can always make a screenshot of the diagram, though. If it weren’t for the help book, most of the users would have given up on the game after the first couple of levels. The game requires patience, and very few people are really patient, but the help book does not spoil the game. On the contrary, with a little help, you feel encouraged and preserve the curiosity and enjoyment when you advance in the story, which is rewarding, indeed. Machinarium appeals to both puzzle game aficionados as well as those who couldn’t care less for the puzzles. You can download Machinarium from Google Play store for $3.99, and considering it is $10 for PCs and Macs, it is really great bargain. A unique unforgettable experience for both fans of puzzles games and simply those looking for an original game unlike any other. Machinarium is a puzzle adventure in a hand-drawn world, where you guide a cute disassembled robot named Joseph through the city of Machinarium. Each level presents a series of puzzles to complete, and you only get one hit for level, but the comic help book will provide you with detailed instructions on how to solve the puzzle, making you play a little minigame each time you want to get to the hint. Note: it’s a 220 MB download.